Ward is coming off a season where he finished with 46 receptions for 381 yards and two touchdowns, the lowest totals in each category since he was a rookie in 1998. He took a back seat on the field to younger players like Antonio Brown, Emmanuel Sanders and Mike Wallace. Despite his back seat on the field, it seems that most of the players including those who have basically taken over his on the field role view him as a leader of the team and in the club house and want him to stay with the team. Ward was asked after the Steelers loss to the Broncos if he was considering retirement and he said absolutely not. The Steelers have adjusted the contracts of CB Ike Taylor and linebackers Lawrence Timmons and LaMarr Woodley. Restructuring might be necessary even with the likes of S Troy Polamalu who is schedule to make $6.25 million next season and QB Ben Roethlisberger who is scheduled to make $11.6 million next season. 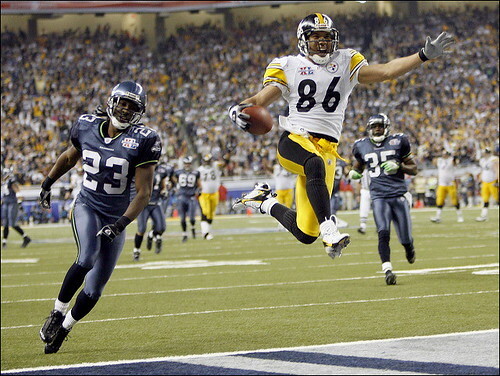 Ward, now age 35, has said on venues such as Twitter that he wants to retire as a Steeler. Ward said, “I don’t normally like to respond to rumors, but as I’ve said all along, I want to finish my career with the Pittsburgh Steelers. And as I’ve already told the organization, I am willing to work with them to restructure my contract to make sure this happens.” The organization might not be as willing given the options they have with younger and cheaper players. If the reports are true, Steelers fans are about to find out just how much of a business the NFL is. Ward may play next season, but it likely will not be in a Steelers uniform. It’s a sad reality of the NFL and all sports. In the end, it’s just business.